The patient about whom Englander was speaking was a woman with multiple sclerosis (MS) who had undergone angioplasty on veins in her neck to improve blood flow from her brain. Englander told this anecdote to the assembled media at a press conference at the Society of Interventional Radiology’s (SIR) 37th Annual Scientific Meeting in March. Englander’s story illustrates the treatment has potential, but MS patients may see it as more than just one of a growing number of anecdotal cases regarding what is called chronic cerebrospinal venous insufficiency (CCSVI). According to the National Multiple Sclerosis Society, CCSVI is thought to be an abnormality in blood drainage from the brain and spinal cord that may contribute to nervous system damage in MS.
Italian vascular surgeon Paolo Zamboni, MD, first theorized and published initial findings on CCSVI and angioplasty for MS patients—sometimes called the liberation treatment—in 2009. While some follow-up research has shown evidence of CCSVI, other studies have not. Some physicians are skeptical about using angioplasty to treat this chronic autoimmune disorder, which affects movement, sensation, and bodily functions. MS is caused by the destruction of the myelin insulation of nerve fibers in the central nervous system. Still, symptom improvement in enough patients has led to angioplasty’s use in a growing number of MS patients despite the absence of large-scale, well-controlled clinical research. Patient Facebook posts and YouTube videos tout CCSVI “miracles” following the procedure. There are more modest Internet descriptions, too. In the meantime, guided by hospital institutional review boards, more research is in development and under way to assess both CCSVI’s role in MS and angioplasty’s effectiveness as a way to treat symptoms. A new treatment could bring hope and help to an estimated 400,000 people with MS in the United States and 2.5 million people worldwide, according to figures from the National Multiple Sclerosis Society. MS has no known cure, but relieving symptoms that may allow a patient to keep working or perform routine tasks is obviously of value and interest. However, as news of angioplasty for CCSVI spreads, physicians are experiencing pressure from patients to carry out a treatment that hasn’t been well studied and isn’t supported by long-term data. The research presented at SIR builds on Zamboni’s initial reports and others’ work. Ferral was the lead investigator in a study that reviewed 105 angioplasty treatments in 94 MS patients aged 26 to 67. The patients’ jugular and azygos veins were evaluated with selective venography and intravascular ultrasound. Angioplasty was performed if the imaging confirmed vein reflux, or a greater than 50% narrowing in the vessel’s diameter. If necessary, stents were then used to treat nonresponsive lesions or blockages. All patients received blood-thinning medications for six weeks after the treatment. The classifications of MS types include primary-progressive, which means a gradually progressive disease without remission; relapsing-remitting, which demonstrates acute attacks with intervals of slow improvements in symptoms; and secondary-progressive, where a disease that was once relapsing remitting is now slowly progressing. “These important results revealed that, for people with multiple sclerosis who experience debilitating symptoms, minimally invasive interventional radiology treatments can be an effective palliative treatment that also may improve their quality of life,” Ferral said. He also stressed the need for both ongoing well-designed research and for patients to continue seeing their neurologists. Additionally, in 2011, a SIR Foundation research consensus panel noted that large-scale, controlled, multicenter trials need to be done to explore CCSVI. Englander worked with Kenneth Mandato, MD, also of Albany Medical Center, on another study focusing on endovascular treatment for CCSVI. Their work also found the procedure to be safe and that it may produce short-term term improvement in the quality of MS patients’ physical and mental health. The study reviewed surveys about symptom relief from 192 patients with different subtypes of the disease regarding symptom relief, according to data provided at the press conference. Classifications within a diagnosis of MS include primary progressive, which means a gradually progressive disease without remission; relapsing remitting, which demonstrates acute attacks with intervals of slow improvements in symptoms; secondary progressive, where a disease that was once relapsing remitting is now slowly progressing. MS subtypes within the Albany study group included 96 patients with relapsing-remitting, 66 with secondary-progressive, and 30 with primary-progressive MS. Most patients received angioplasty alone, but three received angioplasty and had a stent placed. As with any promising treatment, patients often pursue it before definitive clinical trials are complete. Mandato addressed that aspect of angioplasty for CCSVI in MS patients. Researchers also acknowledged concerns about the symptom improvement being attributed to the placebo effect, which has not been considered in existing research but certainly is a possibility in a treatment where approximately 40% of recipients did not benefit from treatment. Ferral said all his patients are optimistic before they undergo the angioplasty treatment, but that one month after the procedure, about 40% tell him, “I feel you’ve done nothing for me.” He told the press conference audience that the prospective clinical trials need to incorporate a double-blind component to assess the possibility of the placebo effect. But Ferral is convinced that efforts should be undertaken to better understand CCSVI and its potential implications in MS patients. 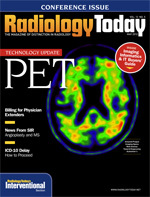 — Jim Knaub is the editor of Radiology Today.